Remakes and hybrids held together by the spliced together storylines of past smash successes in the literary, film or stage worlds are nothing new. No, as it turns out, the practice of striking while the iron (er, film fodder) is hot has been around as long as we’ve had a studio system. It’s this realism that explains this subpar cinematic rip-off of the Pulitzer Prize winning play You Can’t Take It With You that would go on to garner two Oscars two years later for Best Picture and Best Director when it was helmed as a superior, straightforward adaptation by American dream specialist Frank Capra, who turned it into a screwball classic. 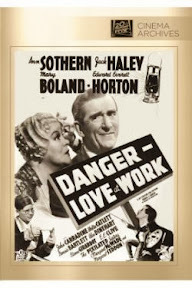 Using the 1936 play by George S. Kaufman and Moses Hart to influence the overall structure, style and main storyline in a loose reimagining of the source material that celebrated unconditional love of family and the gift that is freedom, James Edward Grant also drew from another screwball classic of ’36 to infuse the muddled script for Danger – Love at Work with a romantic comedy arc. 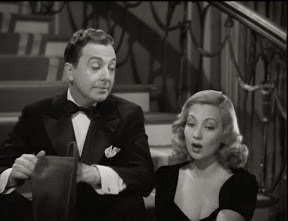 Although he hoped to employ the same male/female banter of one-upmanship as evidenced in filmmaker Gregory La Cava’s still fresh, fiercely funny and influential My Man Godfrey, unfortunately Grant’s overwrought repetitive script, co-written by Ben Markson is all over-the-place in its tale of a lackadaisical lawyer who is offered one last chance to prove himself. Given an assignment that’s driven his coworker batty, he’s sent to track down the signatures of eight South Carolina property heirs in order to transfer the land to a hunting club eager to purchase it for one hundred thousand dollars. Predictably, things go wrong from the start as he makes a bad impression on one of the relatives on the train coming down from New York. Our hero meets his match in the form of a ten year old Harvard bound brat eager to put him through the wringer when he’s unknowingly experimented on in a series of anger inducing escapades to test a theory about the correlation between hair color and temper. 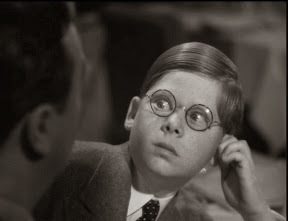 And after he sinks to the boy’s level, it’s up to the kid’s older sister (gamely played by Anne Southern) to flirt and fight with the lead on the family’s behalf. 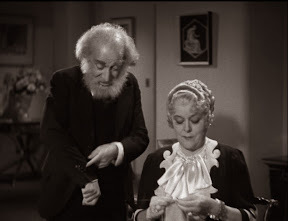 Replaced just days before the shoot to make up for the thick accent of French lead Simone Simon in the role that was then given to Southern, while she does her best, her chemistry with Jack Haley’s Henry MacMorrow feels more forced than free-flowing. And that’s actually the greatest problem of the movie given the speed and strength with which everyone reads their lines, hits their marks and lands their pratfalls and physical gags that renders Danger an overly wooden, stagey production. In other words, there’s too much work on display in Work. Completely out of his element as a director for hire on a mediocre comedy, future dramatic movie ace Otto Preminger is an odd fit for this little seen, often out-of-print rarity. Recently released to film buffs as part of the most recent wave of Fox Cinema Archive classics of overlooked discs made direct-to-order on DVD demand, Danger pales in comparison to the two classics it was trying to copy a la You Can’t Take It With You and Godfrey. Nonetheless for Preminger fans eager to see where the director of the quintessential Film Noir Laura began with this – his third picture at the helm – it’s well worth a look. 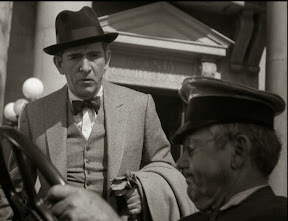 In doing so, you’ll discover that Preminger was always drawn to outsiders who stole scenes from the leads and delivered the most quotable lines – even if most of the time we can’t imagine ever wanting to willingly be in the same room with any of them for more than a scene or two – before the camera zeroes in on someone else.